RB-Brian Hill-Can the Cowboy become big time? Each year are hundreds of stories being told during the planning and anticipation of the NFL Draft; the 2017 NFL Draft is no different. 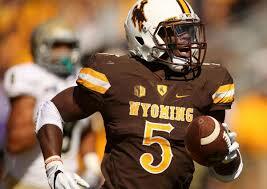 Today we will be looking at a scouting report for junior running back Brian Hill, Wyoming Cowboys. RB-Brian Hill, Wyoming 6’1” 219 lbs. Cons: The problem with most backs that are six feet plus is that they tend to run high and Hill is no exception to that. This allows would-be tacklers into his body more quickly and makes him easier to bring down. The back cannot create on his own; he must have a crease created for him to exploit. When Hill runs with the ball, his other arm kind of flops around. It would be better used to stiff-arm or brace against defenders than look like he was bull riding. I didn’t see much of a second gear in open spaces. He was rarely used in the passing game and seldomly sold the route he was running for the quarterback. This let opposing defensive coordinators ignore that side of his game with only eight receptions last season. His pass protection leaves a lot to be desired as the runner either drops his head or gets off-balance when attempting to block incoming blitzers. Pros: Hill is a gritty, fast-twitched runner that gets skinny in the hole. He does a good job working through the trash at the line of scrimmage with his quick feet. The back uses spins and hurdles, finds the cutback lane, and wiggles away from the defenders. The former Cowboy is an inside to outside runner who reads the gridiron well while following his blockers and always keeps his legs churning. Hill plays with short-burst quickness along with jump cuts that can get him away from the defense and find the end zone regularly. Overall impressions: While I like Hill’s athleticism, I’m not sure what role he will receive at the next level. He is a good two down back that doesn’t catch or block particularly well. This gives defenses a clue what plays an offense can call due to personnel. I see Hill as more of a kick returner to start, but he reminds me a lot of former Colt and Patriots back, Donald Brown, who was good, but not great. The former Cowboy is just outside my top ten rookie backs right now.